Traceroutes will never look the same again. 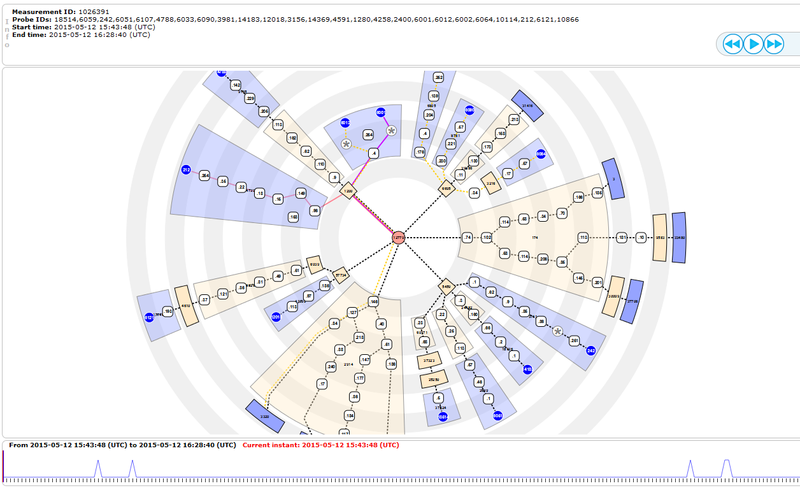 Radian is a web tool that visualizes traceroute data performed in an IP network, like the Internet. Traceroute is a networking tool that returns the sequence of IP addresses traversed to reach a given destination from a given source in the network. Radian allows the user to explore data by interacting with the visualization, and to see the evolution of routing by means of animations. It also allows to look at the network at different abstraction levels. In the setting of interest, several vantage points (probes) periodically perform traceroutes towards a fixed target. Radian merges the resulting paths into a graph, which is visualized with the probes at the periphery of the drawing (depicted as blue circles) and the target at the center (depicted as a red circle). Traceroute paths are represented as colored paths from the probes to the target. While dashed paths represent traceroute that did not change over time, solid lines involve some dynamics in the routing. The user can review the dynamics by clicking with the mouse on the Play button on the top or on the event timeline on the bottom. An event in the routing is shown with an animation of a path from its initial position to the final one. IP addresses are grouped into the Autonomous Systems (AS) (which are Internet administration units) they belong to. An AS is represented as a colored box, blue ones contain probes while yellow ones are only for transit. The user can double-click an AS to expand or collapse it, to choose the amount of detail to see. Shift-clicking a probe shows at the bottom of the interface a line chart with the round-trip time (RTT) of that probe, as measured at the target node. A value of zero conventionally means lack of reachability. RIPE Atlas anchors: view data from the RIPE Atlas project, with traceroutes periodically performed by Atlas probes towards Atlas anchors. Specify your query with a convenient web interface. File upload: view your own data by uploading a JSON file. The supported web browsers are Mozilla Firefox and Google Chrome. This service is provided as is, without warranty of any kind. Use of this service is entirely at your own risk. We cannot take responsibility for any direct or indirect damages resulting from the use of this service. By using the "file upload" interface you accept that the uploaded data will be remotely processed by our server to provide the service. Thousands of probes distributed all over the world continuously perform traceroutes towards selected targets (called anchors) in the Atlas system. Our service lets you select a target and probes, then it dynamically queries Atlas to show you the traceroutes performed in the last two hours. Create a JSON file with your traceroutes and upload it to view it in Radian (example). The data format is described in JSON Schema. Why can I select only up to five probes? Because this service is a demo. Can I include Radian in my website? This is a research project, please contact us before attempting at doing so. How do you map IP addresses to ASes or geographical locations? We use the free databases from MaxMind and GeoNames. Does Radian completely run in the web browser? No, there is a server-side that takes care of computing layouts and interacting with RIPE Atlas. Radian was created by the Graph Drawing and Network Visualization group at Roma Tre University, Italy. Massimo Candela, Marco Di Bartolomeo, Giuseppe Di Battista, Claudio Squarcella. Radian: Visual Exploration of Traceroutes . In IEEE Transactions on Visualization and Computer Graphics. 24(7):2194-2208. Jul 2018. doi: 10.1109/TVCG.2017.2716937. Accepted version. Massimo Candela, Marco Di Bartolomeo, Giuseppe Di Battista, Claudio Squarcella. Dynamic Traceroute Visualization at Multiple Abstraction Levels . In, Stephen Wismath, Alexander Wolff, editors, Proc. 21st International Symposium on Graph Drawing (GD '13), Springer-Verlag, volume 8242 of Lecture Notes in Computer Science, pages 500-511, 2013. Work partly supported by the European Community's Seventh Framework Programme (FP7/2007-2013), grant no. 317647 (``Leone'' project). Feel free to contact us at radian at ing dot uniroma3 dot it. If you are interested in Internet visualization you may have heard of BGPlay, a previous work of us for visualizing BGP data. It is well appreciated by network administrators and it is currently hosted at the University of Oregon Route Views project. Recently, RIPE NCC worked with us to produce a renewed version of BGPlay that is hosted on the RIPEstat website.